Biggleswade v Northampton Casuals. Picture: Guy Wills. Two tries in the final quarter flattered the visitors as Biggleswade went down by 11-27 to Northampton Casuals in Midlands 3 East (South) on Saturday. Biggleswade had most of the possession and territory but could not find a way through the packed Casuals defence. But when Casuals had the glimpse of a scoring opportunity they made Biggleswade pay for just one missed tackle. Biggleswade had one change from the side which played two weeks ago with Ieuan Evans in for the crocked Zack Pates. They knew they faced a tough challenge. For long periods of the game Biggleswade were on the attack but came away with little to show for their efforts. Biggleswade dominated the scrums often having the visitors on the back foot. Unlike in a previous match Biggleswade were rewarded for their dominance with a number of penalties. Biggleswade started brightly but it was the visitors who scored first. A penalty kick into the corner saw Casuals win the ball and drive over the line for the try which was converted. Biggleswade cut the deficit thanks to two penalties from Elliot Tunstall. The first was awarded when the Biggleswade pack shunted the Casuals back forcing them to stand up. The second was for off- side in front of the posts. Turning round just a point behind Biggleswade had hopes of a good result, but their hopes were quickly dashed. 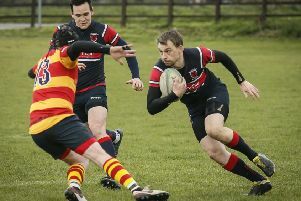 A cross-field kick went straight into the hands of the Casuals winger who stepped on the gas and evading the first tackle had space to move and create a try. Worse was to follow as Casuals added a second almost from the re-start. Biggleswade were now chasing the game and as hard as they slogged away at the Casuals line they seemed destined to fail. One attack after other fell inches short or ended in a penalty against allowing Casuals to clear their line. Eventually after Gavin Taylor had made one great scything run down the centre which saw him hauled down within an arm’s length of the try line a chink of light appeared. A powerful scrum from the tireless Biggy pack created a small gap wide out which saw winger Elliott Tunstall through from close range. The euphoria was not to last long as once again Casuals scored two tries in quick succession to wipe the smiles off the Biggy faces. The euphoria from the visitor’s number fifteen showed their relief that they had finally got out of jail and snuffed out the determined challenge from the hosts. Coach Shane Manning was very upset with the result blaming wrong options had let the side down. Biggleswade had also lost the services of two players to the bin at different times which were avoidable. The first was for a high tackle. The second for a ruck offence after the referee had warned that the next guilty culprit would be binned. Casuals too lost a prop for a repeated infringement in the “red zone”. It was that kind of a game played at a furious pace and at high intensity. Luke Haverly is unavailable as he has a minor operation but tall centre Will Simkins is expected to be available. The match kicks off at 2.15pm.